At a time when online shopping has emerged a new trend of hassle-free shopping, one of the customers of Pathsala has been allegedly duped by an online shopping company. The customer, identified as one Nitish Das, who himself is a shopkeeper of Pathsala town in Barpeta district, ordered one watch at a price of Rs. 6,996 from Myntra, an Indian fashion e-commerce online shopping company. 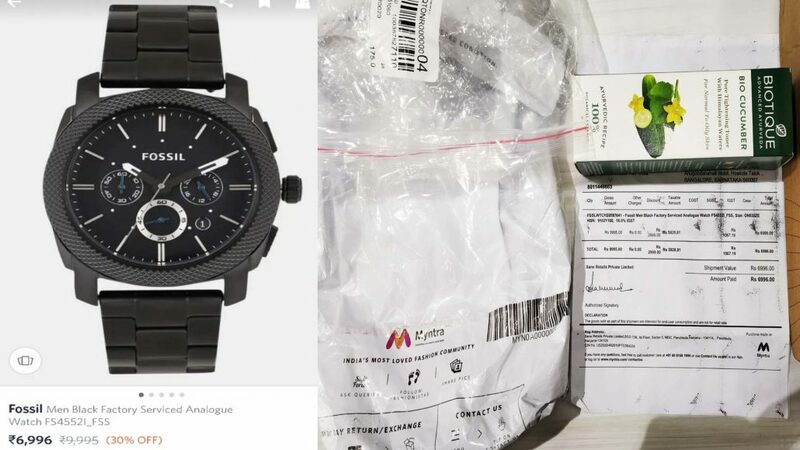 But Das was surprised when he received the packet through courier as he found one bio oil bottle worth Rs.175 instead of a watch of Fossil brand worth Rs Rs. 6,996 which he had ordered. The customer also informed that he paid the company the full amount through his bank account at the time of booking. A shocked Nitish Das has already lodged a complaint with the authority concerned to unearth the fraud. He also appealed to the Myntra authority to look into the matter. It has been alleged that many such incidents happen with online customers who receive fake or damaged products. It may be mentioned that digitisation and convenience of online shopping have been picking up pace rapidly across India on the back of increasing penetration of internet and smartphones. Many of the customers also opt for online shopping as on several occasions, the online shopping companies announce offers.